In medium-size bowl, beat eggs, then whisk in flour. Gradually add half-and-half and water. Add salt and butter. In a griddle on medium-high heat, add cup batter. Tilt pan in circular motion and swirl so batter is even. Flip to other side. When six crepes are done, lay them on a cutting board. 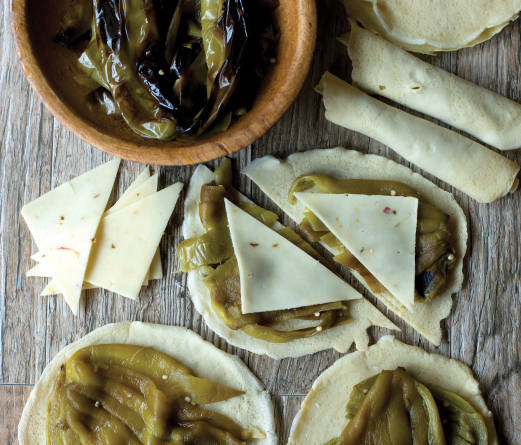 Place green chile in the middle of each crepe and cut crepe and chile in two. Place a half slice of pepper jack cheese on each before rolling up crepe. Makes 12 snacks that can be served cold with hummus, sour cream, or spreadable cheese. They can also be left whole and heated, like chiles rellenos.